For Valtulina, see Marco Valtulina. Valtellina or the Valtelline (occasionally spelled as two words in English: Val Telline); German: Veltlin, Italian: Valtellina, (Lombard: Valtulina, Romansh: Vuclina) is a valley in the Lombardy region of northern Italy, bordering Switzerland. Today it is known for its ski center, hot spring spas, bresaola, cheeses (in particular Bitto, named after the river Bitto) and wines. In past centuries it was a key alpine pass between northern Italy and Germany and control of the Valtellina was much sought after, particularly during the Thirty Years' War. The most important comune of the valley is Sondrio; the others major centers are Aprica, Morbegno, Tirano, Bormio and Livigno. 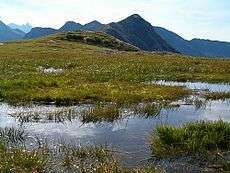 Although Livigno is on the northern side of the alpine watershed, it is considered part of Valtellina as it falls within the province of Sondrio. During the 16th, 17th and 18th centuries, the Valtellina belonged to Graubünden (the "Grey Leagues"), which was then a mutual-defense region independent of Switzerland but is now the easternmost Swiss Canton. Graubünden is an area in which German, Romansh, Lombard and Italian are all spoken, and hence during 16th century rule by Graubünden, the region became known variously as Veltlin, Westtirol (West Tyrol), and the Welsche Vogteien ("Romanic Bailiwicks"). During the Thirty Years' War, the Valtellina was a theater of intense military and diplomatic struggle among France, the Habsburg powers and the local authorities. At stake was control of the routes through the Valtellina territory to the passes between Lombardy and the Danube watershed. The anti-Habsburg forces in the Three Leagues put together a court that between 1618 and 1620 handed down a number of convictions (often in absentia) against Catholics in the Leagues and Valtellina. The harsh judgments of the anti-Habsburg Thusis court led to a conspiracy to drive the Protestants out of the valley. The leader of the conspiracy, Giacomo Robustelli of the Planta family, had ties to Madrid, Rome and Paris. On the evening of 18/19 July 1620, a force of Valtellina rebels supported by Austrian and Italian troops marched into Tirano and began killing Protestants. When they finished in Tirano, they marched to Teglio, Sondrio and further down the valley killing every Protestant that they found. Between 500 and 600 people were killed on that night and in the following four days. The attack drove nearly all the Protestants out of the valley, prevented further Protestant incursions and took the Valtellina out of the Three Leagues. The killings in Valtellina were part of the conflicts in Graubünden known as the Bündner Wirren or Confusion of the Leagues. In February 1623 France, Savoy, and Venice signed the Treaty of Paris in which all three signatories agreed to re-establish the territory of Valtellina by attempting to remove Spanish forces stationed there. In 1797 the growing power of the First French Republic created the Cisalpine republic in Northern Italy. On 10 October 1797, the French supported a revolt in the Valtellina against the Graubünden (Grisons in French), and it joined the Cisalpine Republic. After the Congress of Vienna in 1815 the Valtellina got part of the Kingdom of Lombardy-Venetia, which was a constituent land of the Austrian Empire. In 1859 it came, together with Lombardy, to the Kingdom of Sardinia, and finally in 1861 it got part of the Kingdom of Italy. At the end of the 19th century there was substantial migration out of the Valtellina for reasons of the prevailing economically depressed conditions of the region and for young men to avoid conscription. Australia, especially Western Australia, was a popular destination for such migrants. Industrially, the area is famous as the home of the world's first mainline electrified railway. The electrification of the Valtellina line took place in 1902, using three-phase power at 3,600 V, with a maximum speed of 70 km/h. The system was designed by the brilliant Hungarian engineer Kálmán Kandó who was employed by main contractors the Budapest-based Ganz company. The culture of the inhabitants of the region north of Morbegno in the Costiera dei Cech is believed to originate from the 8th-century Frankish invasion of Italy; the local dialect used to be a mix of Romansch and Lombard Language. These days, however, only Italian and Lombard are spoken. During the last months of World War II, the Italian dictator Benito Mussolini and other diehard fascist leaders of the Italian Social Republic (RSI) proposed making a "last stand" against the advancing Allied armies in the Valtellina. The Fascist Party secretary Alessandro Pavolini was the main proponent of the idea, which he first raised with Mussolini in September 1944. He pointed out that the valley was ringed with fortifications dating from World War I, and had its own electricity generating capacity (hydroelectric). In the last months of 1944 Mussolini's government began moving munitions and food stores to the area. By January 1945, however, no firm decision to make a stand in the Valtellina had been taken. The Germans, represented by Ambassador Rudolf Rahn, were opposed to the idea. In March, with the Allies advancing into the Po valley, Mussolini's Cabinet again discussed the idea. The RSI's military commander, Marshal Rodolfo Graziani, who believed the war was already lost, opposed the plan. This ensured that no serious military preparations were made. In early April Pavolini again raised the plan, which he called "the Epic of the 50,000," claiming that 50,000 Blackshirts would follow Mussolini if he made a stand in the Valtellina. The Germans, who by this time were negotiating with the Allies to surrender their armies in Italy, remained adamantly opposed. Filippo Anfuso, the RSI's under-secretary for foreign affairs, pointed out that valley was already mostly in the hands of the partisans. By mid April, the Valtellina plan was no longer a realistic possibility. Although Mussolini continued to fantasise about dying a heroic death there, the plan had no serious support. When Mussolini left Milan on 25 April, heading north, it was assumed he was going to the Valtellina, but his intentions were never made clear - he told some people he would go to Bolzano, in the province of Bolzano, to join up with German forces. In any event Mussolini's capture on 27 April by the partisans at Dongo, barely short of the Valtellina, ended any possibility of a fascist last stand. In Valtellina the wines are produced mainly from Chiavennasca (the local name of Nebbiolo grape variety) with other minor varieties such as Rossola nera permitted up to 20% for the Denominazione di origine controllata (DOC) and 10% for the Denominazione di Origine Controllata e Garantita (DOCG). Grapes are limited to a harvest yield of 12 tonnes/ha. The finished wine must be aged for at least 2 years prior to release (3 years if a Riserva bottling) with a minimum alcohol level of at least 11%. Yields for the DOCG wines are further restricted to a maximum of 8 tonnes/ha. While the aging requirements are the same as the DOC, the minimum alcohol level for the DOCG wine is 12%. The best-known villages for red wines are: Grumello del Monte, Sassella, Inferno, Valgella, and Maroggia. The village names are normally indicated on the label. Additionally there is an Amarone style DOCG wine called Sforzato (Sfursat). 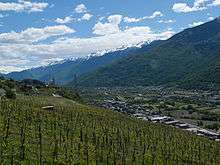 In the lower part of the Val Poschiavo, the valley in the Graubünden canton of Switzerland that descends into the Valtellina at Tirano, similar wines are produced - but under different regulations such as appellation and the allowance of sugar addition, or chaptalization. ↑ Valtellina murders in German, French and Italian in the online Historical Dictionary of Switzerland. 1 2 Paull, John (2014) "Ernesto Genoni: Australia’s pioneer of biodynamic agriculture", Journal of Organics, 1(1):57-81.